For too many years, women’s football, or rather, women’s sport, in general, has been overlooked but in recent years, we have seen substantial growth across the board. This growth has mainly come about due to the exposure it has received via broadcasting. Globally, South Africa has often found itself behind the eight ball but things are changing, and they are changing fast. Currently, we have a national netball league, a women’s cricket team that performed admirably during this year’s World Cup and many athletes coming through the ranks behind our stars, Caster Semenya and Sunette Viljoen. However, football is the most watched sport in South Africa. Our men’s league, the Premier Soccer League (PSL) is one of the richest leagues, if not the richest, on the African continent. However, our men’s team have not performed at a decent level since qualifying for the 2002 World Cup. Banyana Banyana, as we fondly call our women’s football side, has performed well during this time. Competing internationally with Germany, USA and other major nations will always be a tough task, considering financial backing these teams have, but Banyana Banyana has performed above what some might have expected by qualifying for last two Olympic Games tournaments. 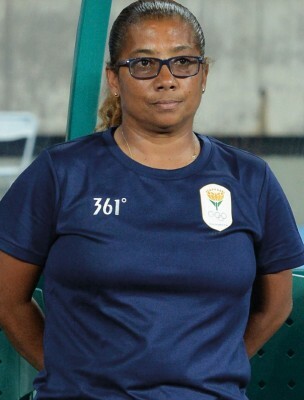 In order to get some insight into the state of women’s football, we sat down with the current interim coach and former Banyana Banyana captain, Desiree Ellis, to see how she made it through the ranks to become what she is today. The early 90s was a different time for women in sport. Not much, if any, money was put into women’s sport—at the very least, it was nowhere near where it is today in terms of financial support. But the love for the game was never diminished among our youth, even in the dark days. With no female football teams in the area during her youth, Ellis simply played with the boys—on the fields or in the street—where she says “the real competitive matches took place”. Jokingly, Ellis tells us how she used to jump the fence at school to go play with the boys and, although this got her into trouble, she was fortunate enough to miss detention because she played netball for the school too. After eventually finding a girls team (at the age of 15), Ellis joined and in 1993, she was selected for Banyana Banyana. She also claimed the vice-captaincy role. Her debut was a day to savour as she scored a hat-trick in a “14-0 drubbing Swaziland”, which, to this day, remains Banyana Banyana’s biggest winning margin. Ellis’ rise through the ranks was fast in the early years. A year after her debut—1994—she was promoted to take up the captaincy role. The early years were tough, as they were for most sports. Coming out of Apartheid, the early- to mid-90s was a rebuilding phase. As captain, Ellis was required to guide her team through this, in general, despite being inexperienced herself on the international stage, but she did an admirable job. It was only in her later years, the COSAFA Cup in 2002, that Ellis and her team claimed their first trophy by beating Zimbabwe in the final. It was a great achievement for the group and for women’s football in general. Post this feat, a new era bloomed for the national team and Ellis’ career as an international player came to an end with the appointment of a new coach. It was an era that promised much—Ellis and her ladies had steered the team through possibly its toughest decade and came out with a trophy at the end—the time arrived for some youth to drive them through the next few years. But as competitive as she was on the field, she was off it, and Ellis quit the game. She continued playing club-level football for another three years before calling it quits on her career as a player. “During this time, I was also involved in football as a coordinator for a community-based project, Stars in their Eyes, who educated coaches through the KNVB, Laureus and Special Olympics ambassadors,” Ellis says. Furthermore, Ellis also took up roles as an ambassador for the 2010 FIFA World Cup and appeared for SABC Sport as a football analyst. Football played a massive part in Ellis’ life; however, she was a sports lover from a young age. Football wasn’t her only love; she also played netball, cricket, hockey and participated in athletics. Eventually, she dropped all sports, bar football and cricket. It was only upon Nelson Mandela’s release that “I got the opportunity to try out for the national team, which meant football year-round”, which meant cricket also took a back seat. Now, with her playing career behind her and a coaching life to look forward too, Ellis started in the right places. 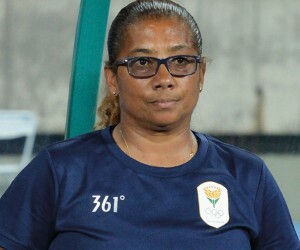 She coached age group teams while still playing and proceeded to do her coaching badges—she currently has a CAF A licence. Last year, she was appointed as the interim coach of the national side, after a stint as assistant coach. Having had some involvement, whether as a player, coach or ambassador, in South African football since readmission into international sport, Ellis’ insight into the game and the future is a rather unique one. She can see it from almost all perspectives and understands the different roles, having been in those positions herself at some point in time. This is the kind of experience that needs to be tapped into in order to further improve our women’s football team and as coach, albeit interim, she sits in the perfect position. Most people who pursue a career in coaching, regardless of sporting code, have a dream to one day oversee their international team. Ellis already finds herself in Banyana Banyana’s dugout and says that she will be “ready, should it become a permanent position”. Recent performances tell us that the future is bright for the national team, however, things can always be better. We need to look no further than what is happening on the international stage to see where we need to improve. This in itself is not ideal. Players for the national team have to be picked from these 9 leagues, which requires a lot of travelling for coaches, selectors and others involved. A professional league is required “where the best play the best on a weekly basis” in order to find and develop the best players. Games can be televised—much like the Netball league—which will give the players a lot more exposure and bring more funding into the game from outside sources, such as sponsors. This is no doubt being discussed at SAFA but time is what is required to set it up in the best possible way. In May this year, SAFA also announced the new collaboration deal with La Liga, which will benefit football in this country in terms of coaching, administration and exposure. Another target defined in this agreement is the development of schools, women and youth football and considering that La Liga has a professional women’s football league, SAFA will not have a shortage of information. In order to constantly improve, one has to play strength vs. strength on a weekly basis. This is only possible once we have a national league but this, along with La Liga’s involvement, will also open up the exposure our players get, which could lead to them moving to play in some of the biggest leagues—like many of our male players have done in the present and past. Current captain of the national team, Janine van Wyk, plays for Houston Dash in the USA and according to Ellis, two more players from our U/20 team play in Iceland but there are not many other exports. Although the job is permanent, Ellis says her focus is not on that at the moment, but rather on “improving individual performance, team performance and of course, goal scoring”. Ellis has the credentials to do the job, and time will tell if the top job becomes permanent but more than her that, she has a clear passion for football in this country and an ambition that has no limits. “We all have a responsibility to profile and lift the game that has given us so much and to continue to improve players and, in turn, that will create opportunities for players,” she says. For now, our team couldn’t be in better hands. Excellence is not there to be obtained; it is a beacon in your path that you need to consistently strive for.